If you have the EZNEC antenna modeling program you may be interested in AutoEZ, an Excel application which makes it easy to use all the new features of EZNEC v. 5.0 such as realistic transmission lines. So what does that have to do with TLDetails? With TLDetails you can choose from a built-in list of line types and see various parameters. Using AutoEZ you can choose from exactly the same built-in list and incorporate one or more lines into your antenna model. Then you can run a frequency sweep and see what the SWR would be at the shack end of the line. For example, here is a sweep using the EZNEC sample model 15MQUAD modified to be 50 ft above Real/Average ground. 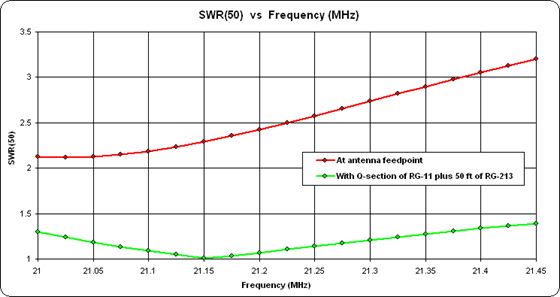 The red trace shows the SWR at the antenna feedpoint. For the green trace, a quarter-wave section (about 9.7 ft) of RG-11 was connected to the feedpoint followed by 50 ft of RG-213 to complete the cable run to the shack. To learn more about AutoEZ click on the banner below. That will open a new browser window so you can read about the program at your convenience without any further interruption on your way to the TLDetails page.